We are moving back to London soon and that brought another climate issue to mind. 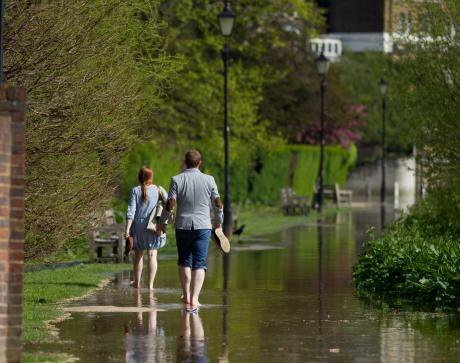 I said it was probably a bad idea to live close to the River Thames, as floods are likely to become more frequent. She’s starting to think Canada might be a better option. If you too ignored the IPCC report this week, I won’t judge you. I skimmed The Guardian story with a mixture of resignation and despair. Thanks, Intergovernmental Panel on Climate Change, I needed cheering up! A viral headline from the BBC, later changed, summed up a the problem: “Climate report: scientists politely urge ‘act now, idiots’”. The challenge for us who want strong action to avert a climate crisis isn’t denial any more: it is apathy, despair and paralysis. In our world of short attention spans, constant shocks and economic insecurity, the warnings are not doing their job. Climate scientists are pushing the button but the warning lights remain dark. The media get a lot of blame for this. As someone who has been tracking the BBC’s failings on climate change for a decade, I think they deserve much of it. But simply pushing the panic button harder won’t work. We need a different alarm system altogether. Why? Because we aren't reaching people with stories that affect them. Simply pushing the panic button harder won’t work. We need a different alarm system altogether. Any story about the climate crisis has to start with a family, not a statistic. We have to stop this obsession with 1.5 or 2 or 3 or 4°C. It means little to non-scientists and sounds like minor differences. Worse, stories of doom make people more depressed. When bad news is everywhere, the first thing we do is ignore the bad news set in the future. The IPCC report was never going to set the news agenda on fire: anyone who expected it to doesn’t understand communication. The climate crisis is first and foremost a story about people: how it is hurting them and how it will upturn their lives. That is where we must start. People are affected by and remember stories they can relate to, not statistics. We need to stop focusing on degrees, sea levels, coral reefs or Arctic icesheets, and focus on people instead. You could say it’s the job of journalists to turn those numbers into stories and you’d be right. But the IPCC updates and the avalanche of doomsday scenarios have created a narrative around statistics and disaster. Politicians overwhelmingly take their cue from this avalanche of numbers. The media dutifully run them on a regular basis and the world moves on. I’m not surprised most people are ignoring them. And that’s just the first problem. Climate change is a left-wing issue. The language, the solutions, the advocacy is almost entirely by and for a left-liberal audience. But those are not the people we need to convince. Right-wingers don’t listen to our warnings because we don’t speak their language and they don’t trust us. Right-wingers don’t listen to our warnings because we don’t speak their language and they don’t trust us. I know what you’re going to say: that we cannot reach those people because capitalist interests already have them convinced. In that case, go home because you’ve already given up. Instead we could list to people like Katharine Hayhoe, a Christian evangelical and a climate scientist, who is trying an approach that involves radically different language and sources trusted by conservatives. Even our solutions are limited. We cannot overcome the climate crisis just through ‘eco socialism’ – it will need billions of investment into clean energy and new technologies too. We have to champion a range of voices and solutions for everyone. Climate scientists are not all political partisans but the people pushing their message almost entirely are. And that’s why so many resist it. We have to convince our political opposites we have their interests at heart because… there is no other choice. I’m a paid-up member of this movement and yet I still don’t know if our governments are hitting necessary targets or how much the shortfall is. Most of us don’t know what goals countries should aim for, so journalists rarely ask politicians how they match up. It allows politicians to make vague promises without firm commitments. What does a world with cheap, green energy look like? Given how cheap solar energy has become just in the last decade, where could we be in 20 years? What is our positive vision? There is no positive agenda so it's easy for our opponents to say we just want to hike up energy prices. There is no pushback to that narrative. None of this is to deny the media could be covering climate change much better. Or that there aren’t big corporate interests opposed to any action. We still need to call out oil companies for funding climate denialism. We also need climate change to be featured in general news coverage, as Genevieve Guenther’s project End Climate Silence is pushing for, and call out the media when they don’t link climate change to natural disasters. But we have to stop hoping journalists will become advocates. Instead we have to get better at setting the media agenda. If we feed it an endless diet of doomsday statistics, readers start to tune out, and journalists have a strong incentive to follow. Big oil doesn’t need to confuse the public when we are already putting them to sleep. I know this debate is not new. Our problem isn't a choice between good news or bad news or between hope and fear - it is that our stories are too abstract and removed from daily lives. The climate crisis is already affecting families like mine, but I can make that link because I follow it closely. Most people don’t because the debate is too abstract. There is little point in just blaming the media for this, though. We can make those links in face-to-face conversations with our friends and families, in our local communities. That would change minds and prompt political action much quicker than we realise. But we have to start the conversation with what is close to our hearts.